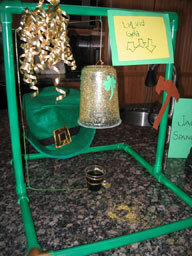 It’s almost time for leprechauns, shamrocks and green water. Yes, it’s March and time for St. Patrick’s Day. If you are looking for some activities and fun things to do with your kids at home or students in the classroom, we have a few ideas. Start with a plan, maybe even diagram your design, then use Legos, cardboard boxes, popsicle sticks, PVC pipes, gold coins, Lucky Charms and green paint to make it come to life. Here is a trap that Steve made several years ago with his son using PVC pipe, gold water and a plastic cup. They spent a little too much time in Home Depot but their end result came out great. Did you know that leprechauns have more than one secret? They know where they have hidden the gold, but they also keep other secrets as well. The leprechaunologists at Steve Spangler Science (yes, we have a few on staff) have discovered the leprechauns’ hidden rainbows, leprechaun beads, leprechaun green worms and leprechaun eggs. Learn more about how to uncover these secrets yourself with our Leprechaun Science Kit at SteveSpanglerScience.com. Leprechauns also know how to turn the water green at your house. Steve did this as well with his kids a few years ago. It’s as simple as waiting for the kids to go to bed and dropping a few color changing tablets into the toilet tank and faucet screen. The leprechauns visit our house every year. In February, my daughters start planning their traps and getting excited about the visit on March 17th. They are sure they will catch a leprechaun and steal its gold. Somehow that never happens but the leprechauns wreak havoc in our house. Chairs are turned over, cabinet doors left open, pillows tossed around and the water is green. I turned the milk green one year but the food coloring does something to the milk and none of us could stand it, so I let the leprechauns know that green milk is not ok. I change the water to green by dropping blue and yellow tablets into the toilet, then unscrewing the screens on the faucets and carefully placing a blue and yellow tablet in each before screwing it back on. You have to be careful because the screen is usually wet, which makes the water drip green into the sink. This trick is old hat in our house, so my girls wake up, run and turn on all the faucets and then check for the next surprise. How fun would this be if a teacher turned the water green in her classroom sink? It has been difficult to come up with different ways the leprechauns can cause mischief. They have left gold flecks (glitter) in a path across the floor, hidden gold chocolate coins, left disappearing eggs (Jelly Marbles in water), colored green carnations (food coloring and water in vase) and leprechaun soup mix. Leprechaun soup is actually Pistachio pudding mix. When you add milk to the mix, it turns green. No one really likes the flavor, so we tend to pitch it after a few days. Baby Got Craft has a great idea for using the pistachio pudding mix in Leprechaun dust. Put a little pistachio mix into a baby food jar, add milk and shake. I like how each kid can make their own individual serving. She also made adorable labels for the jars. I wish I were that crafty. This year, I want to try my hand at green eggs. Not sure I’ll be able to stomach it, but it should be fun for the girls. I also found necklaces at Target and gold coins. I found a few people on Pinterest who have left leprechaun footprints. The Crafting Chicks have a great idea to make tiny footprints with their hands. Don’t forget to check out our Pinterest St. Patrick’s board for lots of leprechaun traps and additional ideas for the holiday that aren’t necessarily science based. What do you do for St. Patrick’s Day? Do you set traps or have leprechaun visits? What fabulous ideas! 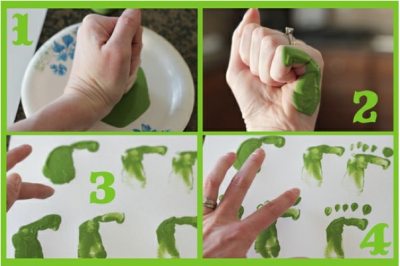 Can’t wait to try these with my kids and my preschool class! Re: Possible green eggs in the shell? Procedure: Take an egg, and very very carefully poke a tiny hole in one end – preferably the pointier end- with the pin. Then, inject the egg with green food coloring- in several places in side the egg. You may need to “stir” the insides with the needle (carefully-you don’t want to break the needle!) or by shaking it really well. If you really wanted to freak out your daughters, tell them you just discovered that Leprechauns also have “leprechickens”. Of course they probably won’t believe you! Later on, after they have most likely forgotten Mom’s crazy claim of “leprechickens”, get them to help you scramble some eggs, or make muffins or waffles (anything that requires eggs to be cracked.) Make sure you grab your “prepared” eggs. Let THEM crack the eggs into a bowl. Surprise! Each and everyone is GREEN!!!!! See??? Moms really DO know what they are talking about!!! What a great idea! I just may have to try it this weekend. Thanks for sharing.